Brand new 19 Row Oil Cooler . These coolers have two male 1/2" BSP (British Standard Pipe) thread fittings as used on most British sports cars from 1955-1981 These are brand new. 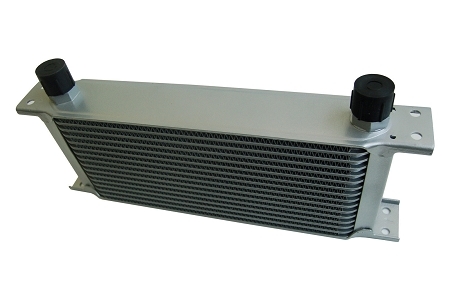 Don't risk a new engine with an old cooler as used coolers are almost impossible to get clean of metal debris. These are perfect for XKE, TR6 and Big Healeys for racing or fast street use or MGA, MGB, TR3-4-7 for racing in hot climates.